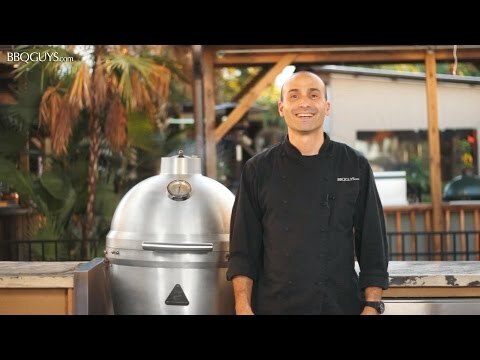 Rated Our Best Kamado Smoker for 2019 - Introducing a tough kamado grill designed to provide a lifetime of performance and memories. Made from one inch thick solid cast aluminum, the Blaze Kamado offers superior durability and outstanding temperature control. The non-porous grill body allows you to use any type of charcoal or wood, as well as any material for lighting the charcoal without worry of damaging or absorbing into the grill body. The heavy-duty 12mm hexagon, 304 stainless steel cooking grate retains heat and helps you achieve an excellent sear. The 20-inch diameter cooking grate is hinged on both sides so you can easily add wood or charcoal without completely removing the cooking surface. A mid-level 18-inch cooking grate is also included which allows you to cook closer to the fire, add a drip pan or a heat deflector for indirect cooking. If you cook food on the middle grate, you need to use high heat gloves to handle the hot cooking grates. The lid hinge is made from 304 grade stainless steel and features a convenient lift assist for easy opening and closing. The Blaze Kamado grill also boasts an innovative lid seal that is superior to ceramic kamado-style grills. Instead of using a felt gasket, the cast aluminum Blaze Kamado utilizes a tongue and groove seal. This design eliminates the need to replace a damaged gasket and also provides an exceptional seal that prevents heat from escaping. The top exhaust vent is made from molded cast aluminum for precise heat control without the risk slipping out of position. The bottom of the firebox holds a removable stainless steel ash pan with handles for easy cleanup. A large temperature gauge with markings for smoking, roasting and searing temperatures is mounted in the lid, allowing you to easily monitor cooking temperatures. The stainless steel grill cart includes six casters so you can easily move the grill around on your patio or deck. The round stainless steel shelf adds valuable workspace to your grilling area but the sleek round shelf design keeps the grill from taking up too much space on your patio or deck. 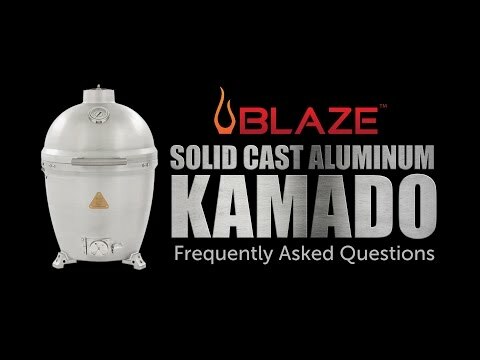 Blaze kamado grills have a lifetime warranty that warrants against any defects in the manufacturing and workmanship on the cast aluminum body, stainless steel cooking grids, hinge and all other parts. Grills must be registered within thirty days for the warranty to apply. I'm a novice at smoking but not grilling. I wanted to stop using lp and go back to wood. After using the Blaze Kamado for about a month, I keep asking why did I wait so long? 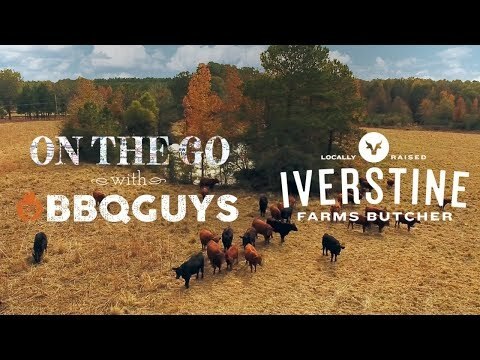 It has been awesome for standard grilling. And now that I did the first smoke, I'm a convert. Setup was easy, construction is solid. I'm very happy with my purchase. Note: This isn't a con but something to consider. Round or side tables. I went with the round and am wishing I'd gone with the side tables. It is a work space issue. I find that I'm always having to work over the round table when cooking. For me, it is just in the way. After using it, I believe the side tables, for me, would have been a better fit for my cooking style. Think about your style before selecting the round table. If you've always wanted a ceramic kamado, but have been concerned about their potential for cracking or breaking, you can absolutely put away your fears with this Blaze Kamado! This grill is virtually indestructible and could literally last forever. It's made of an industry first, solid cast aluminum, and their slogan could not be more appropriate - this kamado is "just that tough"! You can even take it camping or tailgating without fear and cringing over every bump in the road. I also just love the way this grill looks! With it's beautiful silver finish and 304 stainless accents, it will seamlessly blend with the rest of your stainless steel equipment in your outdoor kitchen. If you've read my other reviews or watched any of my videos, you know how much I love kamado cooking. As far as cooking performance, this Blaze Kamado is right up there with the best of them! Heat retention is one of the most important features of a kamado grill, which are known for holding their temperature during long cooks, and the Blaze kamado is no exception. I found the thick cast aluminum walls to hold heat just as well as the ceramic kamados I've cooked on for years. I also like the unique tongue-and-groove design, which seals the grill lid tight to the base, allowing very little to no heat escape. Ceramic kamados utilize a gasket to achieve their seal but those gaskets need replacing from time to time. Along with the solid heat retention, the heat control is top notch. The lower air intake features a multi-function door with a dial for precise control and the built-in, cast aluminum top air vent, allows you to easily set the vent opening, and it stays put even when lifting the lid. Speaking of lifting the lid, 304 series stainless steel lift-assist hinges allow for very easy opening. You can really feel the difference if you've lifted other kamado lids, which tend be be bulky and kinda heavy. Under the hood, you'll find a 20-inch stainless steel hex grill grate. The grate is made of 12mm 304-grade stainless steel, providing amazing heat retention and a large surface area for beautiful sear marks. The grates also feature two hinged sections, which makes adding charcoal or wood chunks a breeze. Underneath this main cooking grid is an 18 inch, equally thick, 304 stainless steel, multi-purpose grate. You can actually cook food on this grate and the top grate at the same time, which almost doubles your cooking space, or you can set a pan of liquid or a heat deflector on it when indirect cooking. Under the multi-purpose grate is an equally thick, 304 stainless steel charcoal grate. When it's time to clean out the ashes, I love the full width, lift out ash pan. That pan is certainly more convenient and effective than scraping out the ashes on a regular ceramic kamado. 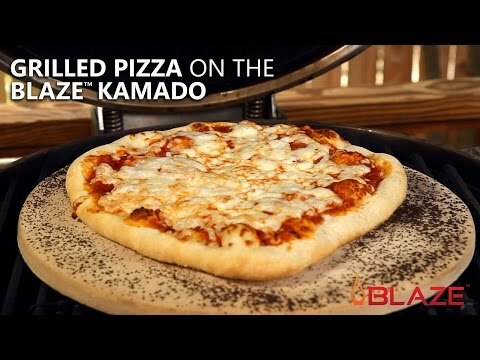 Another neat benefit of the Blaze Kamado's cast aluminum construction, is that it can handle any fuel source, even regular charcoal briquettes and lighter fluid, unlike ceramic kamados with their porous nature. Personally, I would always recommend cooking with lump charcoal but it is nice to know you can use briquettes and lighter fluid in a pinch. As for accessories, the rotisserie accessory with separate charcoal basket is an awesome add-on and I like how the 304 stainless steel side shelves are so sturdy. Finally, I love this grill's warranty. The Blaze Kamado is backed by a best in class lifetime warranty on all of the grill's components - that's all components inside and out. 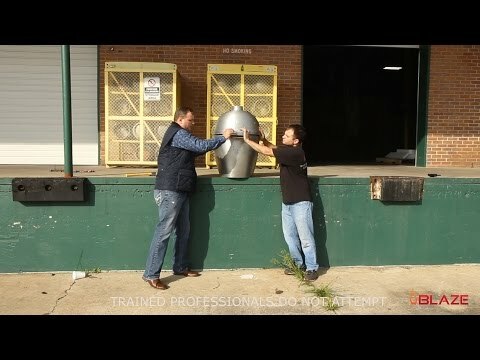 I'm not sure how it's possible to break anything on this grill, but you can have confidence in knowing that Blaze will stand behind your grill for a lifetime. While the full width ash pan is a nice and effective feature, you have to remove all three grates in order to lift it out for clean up. If you want the toughest kamado grill on the market, backed by a best in class lifetime warranty, that looks and cooks great too. 1 Inch 1 Inch 1 Inch 3/4"
20 Inch Diameter 20 Inch Diameter 20 Inch Diameter 25 X 18 1/2"